The theme of this week’s column is Last-Minute Changes. This column is being published less than 24-hours before the start of most of the Sunday games. Technically, it’s less than 12-hours before the first game, owing to the fact that the NFL is making yet another heavy-handed attempt at making the British care about football (real football, not soccer’s pseudonym). Chances are, most people reading this have made their weekly acquisitions and set their rosters. However, there are still a number of question marks when it comes to game-time decisions, and there is still plenty of time to second-guess. Use some of that guessing time on this column, and you’ll be happy you did. Well, maybe you will be; I don’t know… Oh, wow, there I go second-guessing. Let’s get to it before any of us have any more time to doubt ourselves. Arizona Cardinals Passing Game (again): I touted these guys pretty heavily last week, and here I am doing it again. No, I’m not on their payroll; I promise. I feel the need to double-down because the matchup against the St. Louis Rams defense is giving a lot of owners pause. So far this season, the Rams defense has allowed the fifth-fewest fantasy points to opposing wideouts, the fourth-fewest to opposing passers, and the fifth-most to opposing rushers. So, the Cardinals’ running backs should get start-consideration, while their receivers and quarterback should be riding benches, right? Wrong. Totally, completely, and absolutely wrong. First of all, the Rams’ points-against stats are specious. Their QB opponents were Russell Wilson, Kirk Cousins, and Michael Vick—none of whom are exactly known for putting up big number through the air. Furthermore, the only elite receiver the Rams played in that time was Antonio Brown, who, again, had a 35-year-old puppy-killer throwing him the ball. So, to make up for the dearth in passing and catching abilities, the Seahawks, Redskins, and Steelers relied heavily on Marshawn Lynch, Matt Jones, and Le’Veon Bell, who all put up big numbers. The Cardinals, however, have no clear bell-cow at RB; instead, they have a three-man platoon of the now-healthy Andre Ellington and his competition, Johnson & Johnson. No one rusher stands out; but, Carson Palmer and Larry Fitzgerald have both been standing out lately. All of this combined means that St. Louis isn’t as good as we all think they are, and the Cardinals are going to go the air a lot more than any of the Rams’ previous opponents—and the results will be big. Start Palmer and Fitzgerald (and John Brown, if you’re feeling frisky), and sit all of the Cardinals running backs. QB Plug-and-Play: I’m a little late on the waiver-wire advice, since it’s already Saturday, but the most common answers to the Plug-and-Play Problem (patent pending) have been Andy Dalton and Tyrod Taylor, who are currently ranked 3rd and 5th, respectively, among QBs. The problem with them is, they are now both owned in over 70 percent of ESPN leagues. If either is still available in your league, pick him up right this second, either for a grade-A replacement right now, or a trade later down the line. Don’t even finish reading this paragraph. Go to the waiver wire NOW. I’ll wait. … … Ok, we’re back. If neither Dalton nor Taylor is available and you need a replacement for Andrew Luck (or Tony “Glass Bones” Romo), Derek Carr (available in 50 percent of ESPN leagues) now has two consecutive weeks of 20-plus fantasy points, and he’s playing against a Bears secondary that would probably allow my grandmother at least 18 fantasy points. Based on that cushy matchup, Carr is a better start than Matt Stafford, Eli Manning, and Ryan Tannehill—and he may even put up more points this week than Dalton or Taylor. In short, there are plenty of QB options out there right now, so there’s no need to panic if you’ve lost your starter. Foster’s Home for Imaginary Points: First off, I’m proud of that title, and I don’t care what you say, dammit. Second off, this one’s a doozy. 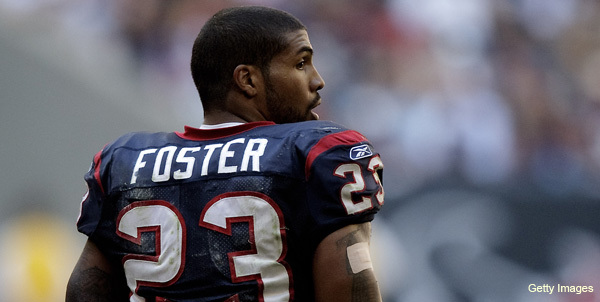 If Arian Foster gets the go-ahead, is he worth a fantasy start? The short answer, for me, is yes… but with an asterisk the size of Yemen (that means a big asterisk. I think Yemen is big? I digress…). On the one hand, the stats don’t lie: Foster logged 29 fantasy points in standard scoring in Week 4 last year when coming off an injury. On top of that, the Falcons are dead last in fantasy points allowed to opposing rushers this season. On the other hand, any time a player is a game-time decision, it’s bad news. Add to that the fact that Alfred Blue rushed for 139 yards last week, and you’ve got a crisis on your hands. I believe that, if he plays, he demands a start—if there are no better options for RB on your team. If you already have one of the league’s few solid RB1s on your team, and you have an RB2 who’s been consistent enough to merit start over Foster, then start both of them. For instance, if you have Adrian Peterson and Karlos Williams (or Eddie Lacy and Mark Ingram, or Jamaal Charles and Melvin Gordon), start them, plug a WR3 or TE2 at flex for a solid 5 points, and avoid Foster altogether. Consistency is better than a gamble. However, if your RB1 is someone useless like LeSean McCoy, Jeremy Hill, or DeMarco Murray; or, if your RB2 is someone flaky like Frank Gore or Chris Johnson, hedge your bets and start Foster. He’s still a gamble, but he’s a safer bet, than most, to put points on the board. Colts and Cowboys wide receivers: Backup quarterbacks are never friendly to wide receivers. Add to that the fact that Brandon Weeden only threw to wide receivers six times last week; sprinkle in the fact that the Colts’ wide receivers have been underperforming even with a totally healthy Andrew Luck at them helm; and you’ve got yourself a fantasy nightmare. Obviously, Terrance Williams, Andre Johnson, and Donte Moncrief are all out, since they aren’t all-too impressive to begin with. The real question mark is T.Y. “No Relation to Paris” Hilton, who is Luck’s favorite target, and would likely be Matt Hasselbeck’s favorite as well. I say he’s worth a flex, provided you don’t have any top-20 WRs or RBs to fill the spot, but don’t bet too heavily on Hilton this week either. Backup QBs are backups for a reason (and a partly-injured QB isn’t much better). Avoid Colts and Cowboys receivers this week. Any and all players on the Dolphins: The Jets have dominated on defense so far this year, ranking in the bottom-ten in fantasy points allowed against every position. The Dolphins, for their part, have struggled offensively. Ryan Tannehill is currently ranked eleventh among QBs, and there are a number of unowned passers who can put up more points than him. Lamar Miller (Matthew Berry’s favorite failure) is currently ranked 46th among rushers. Jordan Cameron, who is a solid start going forward (and a buy-low candidate right now), looks to be playing through an injury. Even the surprisingly talented Jarvis Landry will likely be shut down this week; I just can’t see the Dolphins getting into enough of an offensive rhythm for him to have any relevance. Even a shift in continents (these two teams are America’s London Ambassadors for the week) won’t be able to change the fact that Todd Bowles’ team is clicking right now, and Joe Philbin’s isn’t. That’s all for now; good luck with any and all last-minute shifts before tomorrow. If you have any questions about your lineup, feel free to shoot me an email at lukewitherell@gmail.com or hit us up on twitter @HBTSports . Be sure to check out our other fantasy articles, including my weekly head-to-head DraftKings league with some of HBT’s other writers. And, as always, How Bout That Fantasy!